There are a bunch of little facts that I sort of half-learned in elementary school, and only those that came with terrific mnemonics have managed to stick. I remember the terms “Dromedary” and “Bactrian,” for example, because a D has one hump (like a one-hump Dromedary camel) and a B has two (like a two-hump Bactrian camel). But I never acquired a similar method for remembering cloud types—cirrus, cumulus, nimbus—I know the names but I forget which is which. And then there’s coal. I vividly recall learning about anthracite, bituminous, and lignite coal as a child in Pennsylvania, a state legendary for its coal production. But which type had which properties or uses? It’s all a blur now. Since I did not pursue an education or profession in which this knowledge was needed, my brain apparently decided to delete those records to make space for really important information, such as Star Trek trivia. I do remember, though, that when I was quite young my father took me to a coal mine that offered tours to the public. I thought it was absolutely the coolest thing ever. Getting to ride in that train down into the dark tunnels, seeing all that amazing machinery, and imagining the life of a miner was exciting and mysterious. I’ve always had a fondness for caverns and tunnels—maybe that’s where it all started. As an adult living in California, I rarely think about coal mines. I do, however, think about wildfires and forest fires, especially in the dry months of late summer. Everyone understands that these things just happen—due sometimes to natural causes, sometimes human causes (accidental or intentional). And when they occur, vast firefighting resources are unleashed to contain the fires in order to minimize the risk to homes and businesses. After all, they pose an imminent threat, plain for all to see (and smell). Of course they have to be stopped. But Pennsylvania has the distinction of being home to the largest number of underground coal fires in the United States. And further, that some of these fires have been burning continuously for upwards of 40 years; that they’ve obliterated entire towns; that they vent an unimaginable amount of carbon dioxide and other gases into the already overburdened atmosphere; and that, for the most part, very little is being done about them. All these facts astonish and disturb me, but none more than the very possibility of the fires’ existence. How can a fire rage underground for decades or even centuries? The answer: very easily. Picture an abandoned coal mine—there are thousands of them in Pennsylvania. Although much of the coal has been removed, plenty still remains—perhaps just not in a configuration that’s easily extractable. Miles of tunnels, their ceilings shored up with columns of unexcavated coal, lie empty. Though the entrance to the mine may have been sealed, that seal was by no means complete or airtight. And suppose some of the coal lies very close to the surface—or is even visible in an exposed seam. Now something happens to ignite the coal. It may be a natural cause—lightning, for instance, or even spontaneous combustion given the right conditions. Or maybe a forest fire, or someone burning garbage. Once the coal begins burning, it feeds off the air in the tunnels and the ventilation shafts that were used to supply air to the miners. Still more air seeps through natural cracks in the rock. Coal burns easily, requiring only a tiny amount of oxygen—and with millions of tons of fuel handy, it soon spreads beyond the existing tunnels and into the thick strata of coal that lie under immense tracts of land. When enough of the coal burns through, the ground above it collapses—an effect known as subsidence. The newly formed cracks or pits allow more air in, accelerating the fire’s spread. Meanwhile, carbon dioxide, smoke, and steam escape, killing plants and making the area’s air unsafe for humans and wildlife. No one can say for sure how many such fires currently rage in Pennsylvania, but the number is unquestionably in the dozens. The number is hard to pin down because coal fires that seem to be out can smolder at low temperatures for years and then flare up again; the process of checking to see whether they’re still going carries with it the risk of making matters worse by adding more air. 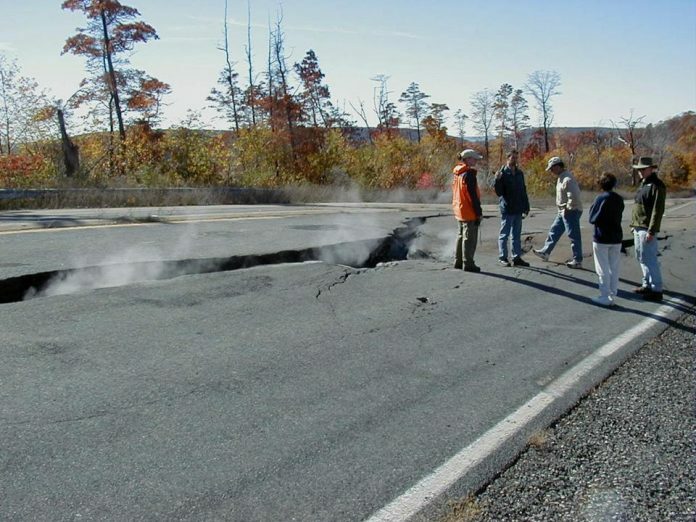 The largest and most infamous of Pennsylvania’s coal fires is under the town of Centralia. It started in 1962, apparently due to someone burning garbage in the town dump. For decades, a combination of bureaucratic delays, funding shortages, and ineffective containment efforts permitted the fire to grow to the point that the entire town (formerly home to 1,100 people) was condemned and basically shut down. A handful of residents remain, despite repeated government orders to evacuate. They enjoy peace and quiet for the most part, but worry about the ongoing threats of subsidence, toxic fumes, and careless tourists injuring themselves. Underground coal fires are notoriously difficult to extinguish. If it were a simple matter of pumping water (or some other substance) into the old mine tunnels to suffocate the fire, they would have been out long ago. Part of the problem is simply getting to the spots that are on fire; another part is pushing out all the oxygen, given the porous nature of the coal and the rock in which it’s embedded. And then there’s the scale: the volume of underground space affected by the fire is immense (and growing all the time). Conservative estimates put the cost of containing (not extinguishing) the Centralia fire alone at well over half a billion dollars. And, of course, that’s just one fire—there’s always another. Since that sort of money is nowhere to be found, officials throw up their hands and say, “We’ll just let it burn out.” How long will that take? Experts think there’s enough coal to keep it going for another 250 years. Pennsylvania is by no means the only place with unquenchable underground coal fires. Similar fires burn in other parts of the United States, as well as China, India, Indonesia, and elsewhere around the world. Under Australia’s Burning Mountain Nature Preserve is a coal fire that has been burning for at least 2,000 years, and possibly as long as 5,500 years. In all, there may be hundreds of thousands of active coal fires, and only in rare cases are any serious efforts being made to stop them. By some estimates, coal fires are a bigger contributor to global warming than cars—a truly staggering thought. Although fighting them is difficult and expensive, very little money has been spent looking for technological solutions. And one of the biggest reasons is simply that the fires are, for the most part, invisible. While a California wildfire may be an obvious threat requiring immediate action, it’s hard to convince governments to put money into solving a problem that can’t be seen—especially when it’s relatively cheap simply to relocate residents and put up fences and warning signs. Note: This is an updated version of an article that originally appeared on Interesting Thing of the Day on October 23, 2004.